Nokkur gervitungl á braut um jörðu taka ratsjármyndir af yfirborði hennar sem ætlaðar eru til kortagerðar. Radarmyndirnar sjá í gegnum ský og veður og sýna annars vegar fasa rafsegulbylgjunnar og hins vegar styrk endurkastsins. Nota má endurteknar myndir af sama svæði til að búa til kort af breytingum sem hafa orðið á yfirborðinu á tímabilinu á milli myndanna. Er þá önnur fasamyndin dregin frá hinni. Ef endurkastið er sterkt má þannig fá kort af breytingunum á sjónlínulengdum frá gervitungli til yfirborðsins, til dæmis ef land hefur sigið eða risið. Snjór, sandfok og gróður truflar mælingarnar, en að öðru leyti virkar þessi tækni vel á Íslandi. Sérfræðingar Jarðvísindastofnunar hafa verið í fremstu röð vísindamanna í heiminum að nýta InSAR-tækni til að ákvarða jarðskorpuhreyfingar. Henni hefur verið beitt hér til að finna aflögun umhverfis flekaskil, aflögun vegna jarðhitavinnslu, umhverfis skjálftaupptök og virk eldfjöll, aflögun vegna minnkandi jökla og fleira. Aðferðin er sérlega öflug ef henni er beitt með GPS-mælingum á sama svæði. Ofeigsson, B. G., A. Hooper, F. Sigmundsson, E. Sturkell, and R. Grapenthin (2011). Deep magma storage at Hekla volcano, Iceland, revealed by InSAR time series analysis, J. Geophys. Res., 116, B05401, doi:10.1029/2010JB007576. Hooper, A., B. G. Ofeigsson; F. Sigmundsson; B. Lund; H. Geirsson; P. Einarsson; E. Sturkell (2011). Increased capture of magma in the crust promoted by ice-cap retreat in Iceland. Nature Geoscience, doi:10.1038/NGEO1269. Sigmundsson, F., S. Hreinsdóttir, A. Hooper, T. Árnadóttir, R. Pedersen, M. J. Roberts, N. Óskarsson, A. Auriac, J. Decriem, P. Einarsson, H. Geirsson, M. Hensch, B. G. Ófeigsson, E. Sturkell, H. Sveinbjörnsson, K. L. Feigl (2010). Intrusion triggering of the 2010 Eyjafjallajökull explosive eruption, Nature, 468, 426-430, doi:10.1038/nature09558. Grapenthin, R., B. G. Ófeigsson, F. Sigmundsson, E. Sturkell, and A. Hooper (2010). Pressure sources versus surface loads: Analyzing volcano deformation signal composition with an application to Hekla volcano, Iceland, Geophys. Res. Lett., 37, L20310, doi:10.1029/2010GL044590. Pedersen, R., Sigmundsson, F., Masterlark,T. (2009). Rheologic controls on inter-rifting deformation of the Northern Volcanic Zone, Iceland, Earth and Planetary Science Letters, 281, 14-26, doi:10.1016/j.epsl.2009.02.003. Auriac, A., F. Sigmundsson, Past and future investigations on present-day glacio-isostatic rebound near Vatnajökull, Iceland, from InSAR and GPS data, In: Proceedings of the IGS Nordic Branch Meeting, Höfn, Iceland, Oct. 29-31 2009 (S. Gudmundsson & Th. Thorsteinsson, eds. ), p. 8-10, 2009. Hooper A., B. Ofeigsson, F. Sigmundsson and H. Geirsson (2008). Recent Deep-Seated Magmatic Activity and the 2008 M6.3 Earthquake: Applicability of ALOS/PALSAR in Iceland, Proceedings ALOS Workshop, Rhodes. Hooper, A. (2008). A multi-temporal InSAR method incorporating both persistent scatterer and small baseline approaches, Geophys. Res. Lett., 35, L16302, doi:10.1029/2008GL034654. Pagli, C., F. Sigmundsson, B. Lund, E. Sturkell, H. Geirsson, P. Einarsson, Th. Árnadóttir, and S. Hreinsdóttir (2007). Glacio-isostatic deformation around the Vatnajökull ice cap, Iceland, induced by recent climate warming: GPS observations and Finite Element Modeling, J. Geophys. Res., 112, B08405, doi:10.1029/2006JB004421. Pagli, C., F. Sigmundsson, R. Pedersen, P. Einarsson, Th. Árnadóttir and K. L. Feigl (2007). Crustal deformation associated with the 1996 Gjálp subglacial eruption, Iceland: InSAR studies in affected areas adjacent to the Vatnajökull ice cap, Earth and Planetary Science Letters, 259, 24-33, doi:10.1016/j.epsl.2007.04.019. Pedersen, R., F. Sigmundsson, Hooper, A. J. and Feigl, K. L. (2007). Extending the temporal coverage of Icelandic crustal deformation measurements through ENVISAT InSAR images, paper ESA SP-636, Proc. of the 2007 ENVISAT Symposium, Montreux, Switzerland, 23-27 April. Hooper, A., P. Segall, and H. Zebker (2007). 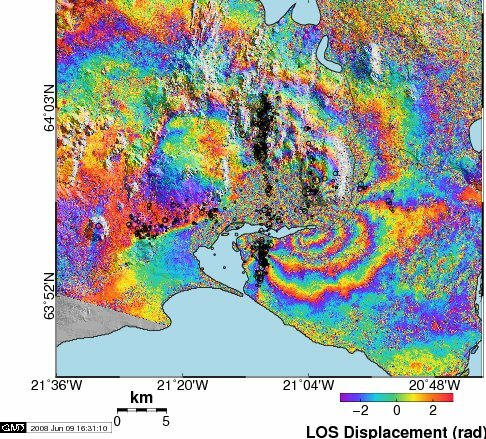 Persistent scatterer interferometric synthetic aperture radar for crustal deformation analysis, with application to Volcán Alcedo, Galápagos, J. Geophys. Res., 112, B07407, doi:10.1029/2006JB004763. Hooper, A. and H. A. Zebker (2007). Phase unwrapping in three dimensions with application to InSAR time series, J. Optical Soc. of America. A 24, 2737-2747. Pagli C., Sigmundsson, F., Árnadóttir, T., Einarsson, P., Sturkell, E. (2006). Deflation of the Askja volcanic system: contraints on the deformation source from combined inversion of satellite radar interferograms and GPS measurements, Journal of Volcanology and Geothermal Research, 152, 97-108. Pedersen, R., Sigmundsson, F. (2006). Temporal development of the 1999 intrusive episode in the Eyjafjallajökull volcano, Iceland, derived from InSAR images, Bull. Volc., 68, 377-393.